By Mauricio Sulaiman – WBC President – I wish to thank FIGHT NEWS for allowing me to share a weekly column with the fans of boxing around the world. This is a great opportunity to share some direct information and get closer to the trenches where the sport takes place and is discussed. I welcome all comments and appreciate those critics whose comments are made with respect and responsibility, as they help us become better. The bell has rung, and we are starting a new journey through this 12-round fight of 2018. Last year represented the rebirth of our great sport, as fans around the world witnessed some spectacular matches. I am certain that boxing will carry on, and promoters and television networks will work and join forces to give fans the fights they deserve. The WBC will cooperate and work towards trying to make the best fights possible throughout the year. We are nearing the spectacular celebration of the WBC’s 2000th world championship fight. We enter this year with 1,989 sanctioned fights in our 55-year history, some of them being the best fights ever with legendary champions including Muhammad Ali, Joe Frazier, George Foreman, Sugar Ray Leonard, Marvelous Marvin Hagler, Thomas Hearns, Roberto Duran, Julio Cesar Chavez, Floyd Mayweather Jr., Manny Pacquiao, and so many other great champions who have fought for the green and gold WBC belt. The WBC convention in Baku, Azerbaijan, reviewed each division and the mandatory status was determined. We pride ourselves on our transparency and open books. Consequently, the WBC reports the mandated status of each division every quarter. Following is the status as we begin 2018 with great expectations. Heavyweight: Champion Deontay Wilder (USA) made his mandatory defense in November, so he is in a voluntary stage and is free to defend his title. He has also expressed his absolute desire to fight Anthony Joshua, which is the fight the world wants to see, and the WBC will fully support such a tremendous bout. Cruiserweight: Champion Mairis Breidis (Latvia) will fight Alexandr Usyk in a unification about in the World Boxing Super Series tournament. 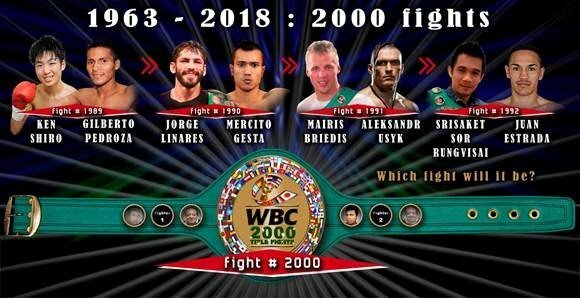 The WBC fully supports this great tournament concept, and the cruiserweight mandatory defense will be addressed at the end of the tournament in May. Light heavyweight: Champion Adonis Stevenson (Haiti-Canada) will fight former WBC super middleweight champion Badou Jack in a highly-anticipated match. Mandatory challenger Eleider Alvarez will fight Oleksandr Gvozdyk for the WBC interim title, due to the fact that the mandatory defense has been delayed for several reasons. Both winners must fight immediately after their matches. Super middleweight: Champion David Benavidez (Mexico) will fight a rematch with Ronald Gavril in February. WBC Diamond champion Callum Smith (UK) was crowned during the WBSS, and will continue to participate in the tournament. The mandatory situation will be addressed at the end of the tournament. Middleweight: Champion Gennady Golovkin (Kazakhstan) has been mandated to fight a rematch with Canelo Alvarez, and negotiations are taking place. In order to allow this rematch, the WBC ordered mandatory challenger Jermall Charlo to fight Hugo Centeno for the WBC middleweight interim championship. Super welterweight: Champion Jermell Charlo (USA) made two mandatory defenses. A final elimination bout between Vanes Martirosyan and Maciej Sulecki has been ordered. Welterweight: Champion Keith Thurman (USA) will return in a voluntary title defense, as he has recovered from his injury. Shawn Porter is the mandatory challenger, and Danny Garcia will fight Brandon Rios in a final elimination bout for the second mandatory due to the inactivity of Thurman. Super lightweight: Champion Terence Crawford (USA) will most likely move up in weight. The WBC ordered both Amir Imam vs. Juan Carlos Ramirez and Regis Prograis vs. Viktor Postol, with the winners to fight each other. Lightweight: Champion Mikey Garcia (Mexico-USA) received special permission to fight over the weight in February in a WBC special event. WBC diamond champion Jorge Linares (Venezuela) will defend his championship in January. Both champions will fight each other immediately after their bouts. Super featherweight: Champion Miguel Berchelt (Mexico) will fight former champion Cristian Mijares in February, and will then make his mandatory defense. The WBC is in the process of voting on a request to officially appoint Miguel Roman as mandatory challenger after he knocked out Orlando Salido. Featherweight: Champion Gary Russell (USA) will defend his title in February, and then make his mandatory defense against JoJo Diaz. Super bantamweight: Champion Rey Vargas (Mexico) will make a voluntary defense, and then proceed to his mandatory defense. Bantamweight: Champion Luis Neri (Mexico) will fight the mandated rematch against former champion Shinzuke Yamanaka in March. Super flyweight: Champion Srisaket Sor Rungvisai (Thailand) will make his mandatory title defense against Juan Estrada in a highly anticipated match in the great promotion named Superfly 2. Flyweight: Champion Daigo Higa (Japan) will defend his title against Moises Fuentes. A final elimination bout will be ordered to determine the mandatory contender of the division. Light flyweight: Champion Ken Shiro (Japan) defended his title on December 31st, and will now fight the mandatory challenger, former champion Ganigan Lopez, in a mandated rematch. Minimumweight: Champion Menayothin (Thailand) will make his mandatory defense against Leroy Estrada from Panama, searching to match Floyd Mayweather Jr.’s record of 50-0. Next week I will be disclosing the status of the WBC Women’s Championship commitments for 2018. The WBC has several priorities for this year and has been working on the proper structure of several committees in order to continue growing in the right direction. Reinforce the Clean Boxing Program and complement the works with the newly created Nutrition Committee to find education materials and procedures to properly reach the boxing community. The Mismatch Prevention System, to find reciprocity among national boxing federations worldwide and to continue identifying those dangerous matches to be stopped before they take place. Illegal entities exist and license fighters who are contracted to tremendous mismatches. Promoters and matchmakers must participate in this process as well. Social Responsibility Programs to continue changing lives around the world through WBC Cares and Pope Francis’ Scholas Foundation program BoxVal, Beyond Sports, and Heroes de Mexico. Emiliano Marsili from Italy will fight Victor Betancourt from Mexico for the Peace Champion Award in a benefit promotion to aid the victims of the earthquakes which struck Italy in 2016 and Mexico in 2017. The launching of the WBC worldwide licensing and merchandising program with direct benefit to former and current fighters. Continue the Brotherhood campaign to dignify our sport with several activities. Fighters will exchange the flags of their countries before each championship match. Boxing is the greatest sport on earth. It is the friendly hand extended to those who have very few options in life, and when they find the gym, their lives change and they then change the lives of many others. I wish you all a prosperous year, and hope that health and happiness is around you and your loved ones. I welcome any comments, ideas or suggestions at contact@wbcboxing.com.